Are you looking for how to write a letter to block your ATM card or debit card? 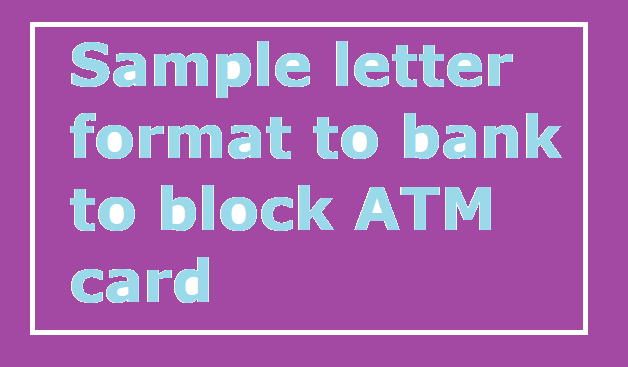 Here is a sample / model format of letter to inform your bank to block your ATM card to prevent misuse of your card by somebody. Learn more details below. Why should you inform to block your ATM card ? There are many reasons to get blocked your card yourself. Nobody want block his / her card. But what if your ATM card is missed or lost somewhere while travelling? In such situation, somebody may misuse your card if the lost card goes into the hand of them. It is unfortunate so you should immediately rush to your bank and tell the bank manager to block your ATM card stating that you have lost your card during travelling. So probably, you must submit a written request letter to block your debit card. Here is the letter format for the same. Subject: Requesting to block my lost ATM card. I, Murugesh, have an active SB account with this Axis bank in you concern. I had a Visa Debit Card / ATM card bearing the number 1234 6578 0913 8732 . The card expires in month of April 2021. Unfortunately, I have lost / missed out the card during a travel from Nagercoil to Kanyakumari. I could not trace the card till now. It has been two days from the date of loss. So I want to block my ATM card immediately and give me new ATM card as early as possible. Thanking you! Note: In From and To field, you must include your particulars to make the letter complete. In the body of the letter format also, you may need to modify the text based on your needs. I forgot my ATM PIN SBI. What do I do ?